Can the fabulous foursome recapture the magic in season nine of Will & Grace TV show on NBC? As we all know, the Nielsen ratings typically play a big role in determining whether a TV show like Will & Grace is cancelled or renewed for a 10th season (NBC already gave this revival an early renewal). Unfortunately, most of us do not live in Nielsen households. Because many viewers feel frustration, when their viewing habits and opinions aren’t considered, we’d like to offer you the chance to rate all the season nine episodes of Will & Grace for us here. An NBC sitcom, Will & Grace stars Eric McCormack, Debra Messing, Megan Mullally, and Sean Hayes. Guests for season nine include Harry Connick Jr., Bobby Cannavale, Minnie Driver, Ben Platt, Michelle Obama, Michael Angarano, and Jane Lynch. The sitcom revolves around a group of best friends in New York City — gay lawyer Will Truman (McCormack); interior designer Grace Adler (Messing); Grace’s secretary, rich socialite Karen Walker (Mullally); and self-absorbed Jack McFarland (Hayes). What do you think? Which season nine episodes of the Will & Grace TV series do you rate as wonderful, terrible, or somewhere between? Should NBC have renewed the Will & Grace show for a 10th season already? Don’t forget to vote, and share your thoughts, below. 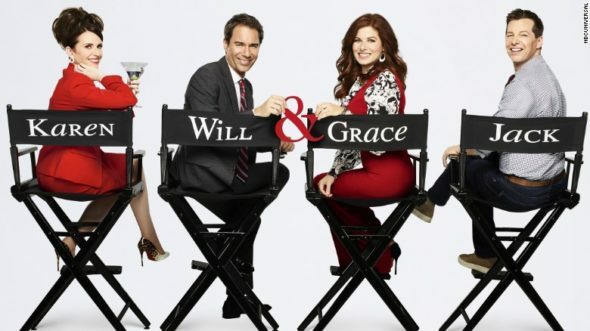 More about: Will & Grace, Will & Grace: canceled or renewed? Best show ever! So happy it is back! This was a great show the first round, and just as great now!! It really is sad that all these years later, some people cannot handle that the world has changed and that they are now the minority. This show really shares that love is love, is love, is love!!! I loved it back then. Hate hate hate it now!! Besides the political crap….its just stupid! And not the funny kind. So glad to see Will & Grace back!! Best show on TV. I”m so glad they did the memorial to “Rosie”. But Will & Grace might have aged but they never grew up. You expected Jack & Karen to not have emotionally progressed. But one would have expected Will & Grace would have. Just a horrible show! Needs to be cancelled! Too political and disgusting!